TYLife tunnels provide year-round protection for almost everything in the vegetable plot and will give you the opportunity to sow and propagate much earlier. GROW TUNNELS - Made from long-lasting UV-stabilized, 45gsm heavy-weight polypropylene fleece with rust-proof, galvanized steel hoops, which easily go into the ground to secure and keep the tunnel in position. 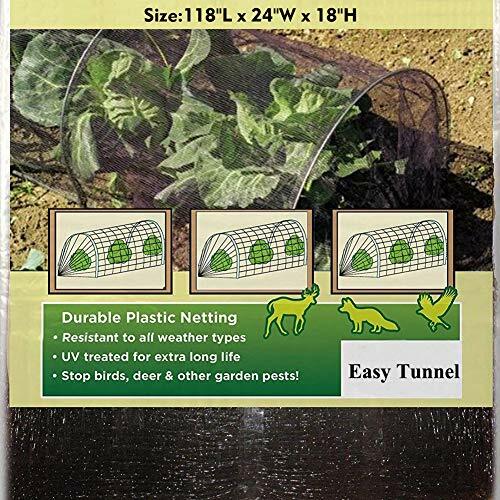 PLANT PROTECTION - These Garden Tunnel Cloche Provide Vital Plant Protection From The Elements And Bugs And Pests.Give Your Seedlings Vegetables And Plants The Best Start With These Essential Grow Tunnels. LINKING - These Garden Plant Protectors Can Be Linked Together By Simply Overlapping. Great If You Need Longer Lengths. Especially Good For Large Allotments. If you have any questions about this product by TYLife, contact us by completing and submitting the form below. If you are looking for a specif part number, please include it with your message.